Birmingham manager Steve Bruce has admitted his future is in doubt after talks over a new contract stalled. The Blues are in the process of a £50mn takeover by Hong Kong tycoon Carson Yeung, which is expected to take another two months to resolve. And Bruce said: "I have made it clear that I would like to stay and see it through but I am also wary that a new broom always wants to sweep clean. "I've been patient enough. I've waited four months as it is." 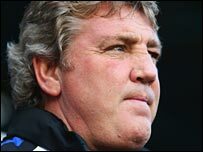 Is Steve Bruce the right man for Birmingham? Bruce agreed a new contract in May but under Stock Exchange takeover rules, no new major contracts can be signed while buy-out negotiations are on-going, unless the paperwork is sanctioned by the club's shareholders. Bruce added: "If the decision is for a change, then I will abide by that too. I am a big boy. We will know more by the weekend, I guess. "I understand that when someone new comes in, spending a lot of money to take the club, they might have their own ideas. The former Manchester United skipper is aware that Hong Kong businessman Yeung may look to bring in his own choice as manager, but is keen to remain in charge under the new regime. "I believe I remain the right man for this job. I have been here coming up to six years and there is something about Birmingham that's got me inside and keeps endearing me after all this time." "I agreed my contract with the existing board in May. Now we're in the process of a takeover, things have been put on hold. "I'm waiting and by Friday, I believe, there will be some decision on it." Bruce took over as Birmingham boss in December 2001 and guided them back into the Premier League last season.